For the introduction to this series of posts, here. For the personal side of my desires in what I’m trying in these writing-thought experiments, here and here. First up, Emily Yoffe writing in Slate on research into emotional states of “elevation.” Just to reiterate, I’m not endorsing or not endorsing her views (or the views/theories of the people she summarizes in the piece). This is working prior to all of that. Simply how did we get here? Warning: Serious thought-density beyond the jump. I will be shortly posting the first in a series of attempts to apply an integral calculus of primoridal perspectives to a piece in the blogosphere. I’m not going to comment on the pieces really as such. I’m doing here an archaeology and simply pointing out how anything in particular can arise through an understanding of the Universe (through this interpretative lens) as coming out of perspectives—perspectives that are missed by the persons themselves (authors, researchers, etc.). This is growing out of my recent reflections about how to do my blogging a little differently. So what follows in these posts will be very experimental, a work in progress. For background on this idea, see here and (more advanced) here, as well as the link above. The basics is that there are three vectors of analysis: spaces (or persons), modes of being in the world (i.e. perspectives), and dimensions (in Wilber’s language, the quadrants). All three of which perhaps helpfully, perhaps unhelpfully can be noted as 123 (e.g. 1st persons, 1st person perspective/pov, and 1st person dimension). The Universe (or Multi-verse or Kosmos) consists (and subsists) through the arising of beings-in-relation who take positions relative to one another. By the time of the human being–at least so far as we are aware on this planet–those perspectives can and do become self-reflective through the self-conscious thought and language. The tendency is to confuse the consequences of our self-reflective thought ontologically (i.e. study of being) for the way things are–called “reification” (or “thing-ification”). So that philosophies and cosmologies become constructed on the premise that the universe is made of energy or systems or thoughts or feelings or whatever. All of which ride first and foremost on the prior perspectives (the positions simultaneously partially free and partially conditioned beings take up relative to one another at the same time that those other beings are taking up points of view relative to the first). Reifying the world corrodes innate freedom and innate relationality. One upshot of this move is that by arguing that perspectives go all the way down as well as up it also opens up a deep connection between the human and other than human forms of life as all consist of 1st persons, 2nd persons, and 3rd persons. Though again those non-human persons or beings need not be thought to have self-reflective thought capacity. They simply only need to be able to take up and resonate/respond to in whatever proto-fashion perspectives of other beings. Even if only at their own level of complexity. The move to re-perspectivalize or point out where the prior (and largely unconscious) movements/positions are taking place is an attempt to get back as close as we can in thought-language to the moment of the choice so we can locate each other and then have the potential to choose life differently. To start to become cognizant (and attentive) in our moment to moment lives of these choices–both our own and others. The only way to do this is to use language (sometimes abbreviations) as pointers to when (I think) these movements are happening and in what way. But since those are movements of the self/soul, to grasp what I’m pointing at requires in oneself trying to take up various perspectives. To feel what it is like from the interior. That way your exploration becomes an entrance for me, you, and others into a collective inquiry, where my rendering becomes open to potential falsification/critique. Minus that scenario, it is just another in a series of damn things/ideas after another. This tendency of everyone to just take up spots (how they got there? by what means? by what means do the means arise?) being left completely undiscussed and the camps that inevitably form, the personaes that become locked in, the group-think, the reactivity that it ignites in the blogosphere (particularly) is what I’m increasingly perturbed by. As well as frankly just being completely exhausted and having no interest in just about anything. Before good, bad, intelligent or dumb or whatever else, there is first the arising horizon (the space) of the thought. And it’s here that I need to go somewhere else–even if for a time fairly alone–in order to connect with something of any real meaning/depth for me. In what follows–I’m still working all this out–I try some different things. Hopefully I will develop into a more consistent pattern of notation. I’m also at times mixing and matching two different views of the Quadrants (the four basic dimensions of any arising moment). One version from Wilber’s, one from Mark Edwards‘. So there won’t be total consistency throughout. I just ran through this post and I’m putting it out there, to see if anyone is interested [ed: probably not :)]. Also while I’ve spent a great deal of time studying perspectives and various notational systems (esp. Wilber’s Integral Mathematics), I can’t say I completely get it 100%. Maybe no one does. So there will undoubtedly by some mistakes and/or disagreements among others who are equally if not more well-versed than I am in this as to how I’m interpreting the data. Some of this is subjective, more art than science. This has been the biggest surprise personally for me in the very limited experiments with this–although if I had been thinking maybe that shouldn’t have come as such a shock. It’s a pleasant surprise nonetheless. The first post is largely itself from my own first person taking up a predominantly third person point of view relative to the issue at hand–i.e. more analytic. I’m still reflecting deeply, inquiring as to how to apply a similar desire (perspectival construct-aware identity in real-time) from within the realm of my first person dimension. i.e. A phenomenology (“to the things themselves”) of this experience. If it’s not utterly apparent by now, these posts will involve ultra nerd philosophical blogging ahead. Follow at your own peril. Don’t saw I didn’t warn you. As I continue to think a good deal (and pray for some creative insight) into how to proceed with this other form of writing I’m looking to do,I’ll be posting some quotations from integral philosophers as a way of helping to introduce theoretically what is moving my thought and what I’m hoping to achieve in a more experimental writing format. We saw that deep features are inherited, not surface features. That is, even though the general patterns (or morphogenetic grooves) of these holons are handed to us by Kosmic karma, all of the actual contents, surface features, and expressions of these habitual patterns are determined by relative, culturally, and personally contingent factors in all four quadrants. But this is where we start to move beyond any of the typical definitions of “deep structures,” “deep features,” or “deep patterns”: for Integral Post-Metaphysics, a “deep pattern” is not an actually existing form or structure but simply a term that represents the probability of finding a particular type of holon in a particular mode of spacetime. 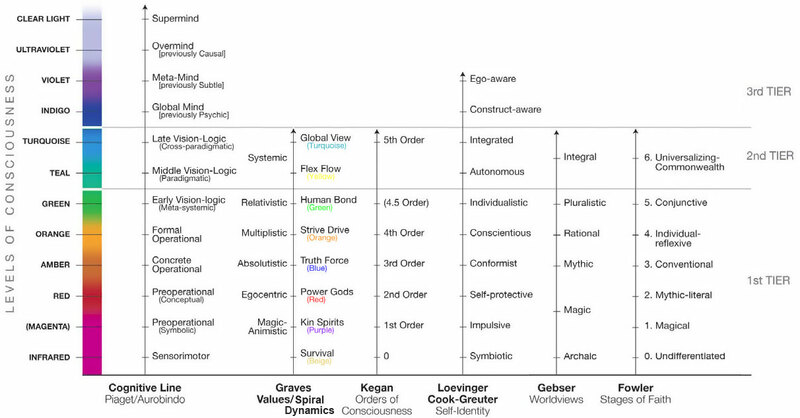 Thus, if we say that a person is “at the red wave,” and the red wave’s general features include egocentrism, preconventional morality, and strong power drives (among others), that does not mean that there is some sort of concretely existing structure, pattern, or adaptive intelligence called “the red structure” (or the red meme or the red module, etc.) such that this person is somehow operating within it and bound by it (or that is somehow “in” the person). All it means is that the person that we identify as operating at or from red is acting in a space where the probably of finding those types of responses is very high (i.e., responses that are egocentric, preconventional, power-laden, etc.). The fewer of those responses you find, the less the person is “at red”–the less they are operating in the space of probabilities of that particular Kosmic habit. A deep pattern, then, is simply a probability wave. The deep features that are characteristic of that probability wave are discovered by doing a reconstructive investigation after the fact of its existence, and not something that we can deduce in a Platonic or Hegelian or Aurobindian fashion before the fact. In other words, to say that consciousness is “at the red wave” simply means that it is vibrating at a particular probability wave: from the outside, we say that it is flowing along a particular morphogenetic field that represents the probability of finding certain types of behaviors at that point in spacetime; from the inside, we say that the feeling-awareness of that holon arises within a horizon of individual and collective prehensions, such that the probability of feeling a certain type of feeling is very high at that particular wave. In English what that means can best be described by an analogy. Take the human skeletal system. There are 206 bones in the human body. If you are going to be born and live as a human being you are going to have a human skeletal structure. Of course specialists can discern differences (in general) between male and female skeletal structures, between people of East Asian, Africa, or Caucasian hertiage, young or old, big or small. But even with those basic variations, there is the same basic structure the planet over. That is the deep structure. Presumably there was a point when that structure came into being (over a period of time to be sure) but now it is set. That structure however (along with say the muscular system, nervous system, also structures preceding the birth of an individual, formally) does not predetermine what a person will look like or how they are as a person–e.g. kind, evil, expressive, shallow, etc. With that basic structural similarity an infinite number of potential permutations are possible. Those are the “surface features” in Wilber’s language. Update I: For the really nerdy among us, check out footnote #9 here, which explains how deep/surface are relative-sliding constructs. Via the good folks at Integral Praxis I see that the also good folks at Integral Life have put together a very helpful (and snazzy) glossary of terms in AQAL integral philosophy. To see what the flibberty AQAL means, click the link. That glossary works for the basic terms in Wilber’s philosophy. What I’m talking about is more an experimental-experiential dive into arising perspectives codified through an as of yet-undefined (or uncongnized) writing process that will help to address (both in the verbal and noun meaning–i.e. to face and location) and dig-out or dig under underlying missed prior movements that give way eventually to thought, action, points of view, policies, strategies, philosophies, worldviews, and the like. I’m hoping as I feel my way through this it will become increasingly shamanic–as in a guided process through various death-rebirth scenarios with the “drumbeat” to entrance in this case being repetition of perspectival moments of arising.